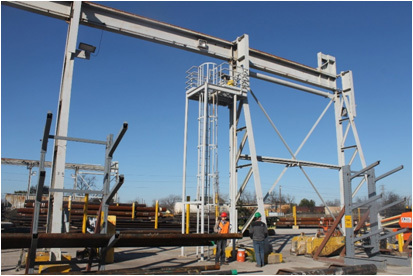 Bridge Crane Access Stairs – A safety focused client came to Clark Engineers with a bridge crane access ladder and platform that was a safety concern. 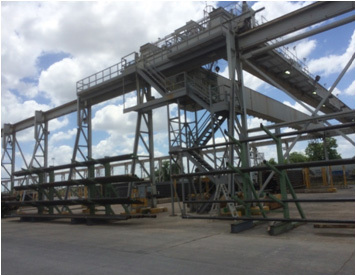 The client required stairs and a platform that could be used for emergency personnel and maintenance (left photo below). Clark Engineers designed an efficient stair case and platform by building off of the existing structure. Part of the existing structure was stiffened to account for the additional dead and live loads (existing members in light blue and modified new members in red). 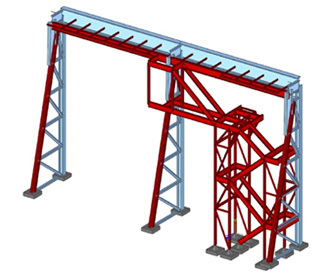 Bridge Crane Structure before and after stiffening – A client engaged Clark Engineers to inspect all connections for 35 ton bridge crane support (220 ft.) and make recommendations. 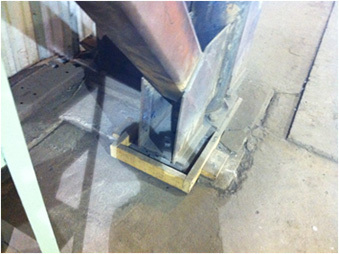 Many deficiencies were found including lack of longitudinal bracing. 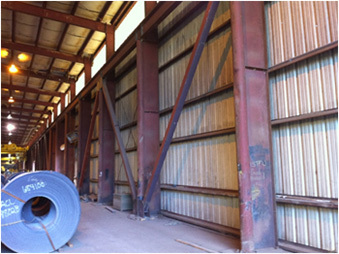 The existing building had two sets of double angle cross braces in 220’. These braces were removed and replaced with twelve structural tube compression braces (each column line) and connections at rail to columns were redesigned. This resulted in a much smoother ride for the bridge crane. Two sets of double angle braces in 220 ft Structure had too much sway movement when bridge crane passed. Replaced bangle braces with Structural Tubes three out of every four bays Crane ran very smoothly after stiffening, dramatically reduced movement.